"We all want our homes to be that 'special place'. The place where we raise our children, entertain our friends and family, a place where we nurture our souls...a refuge from the world; and shouldn't that place, your home, be the best place on earth". For over 17 years we have been dedicated to creating luxury custom homes for luxurious lifestyles, craftsmanship, artistry, and attention to detail. Enjoy coming home every day where your Luxury Lifestyle starts with an abundance of luxury amenities and comfort. Alex Custom Homes will create for you, a home in which you can call...“your Castle!" It is time to fulfill your dream of having your own custom built luxury home. Alex Custom Homes will provide you with the necessary tools in order to see your custom home completed with those special qualities you can call your own. We give you many options in floor plans, special amenities and extraordinary additions. Thinking Of Remodeling Or Adding An Addition to Your home? 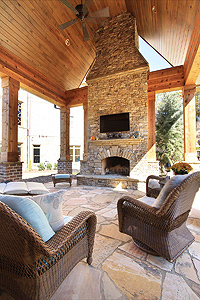 Let Alex Custom Homes Add A Touch Of Luxury To Your Home. Aren't You Worth It?? Custom homebuilder, Alex Custom Homes, understands the importance of selecting the right builder for your new home - a homebuilder who listens and shares your vision; a homebuilder who is totally committed to the delivery of your new dream home, and has been building custom new homes in communities across Atlanta, Georgia. Five Advantages for using a Design-Build Company like Alex Custom Homes over the design-bid-build method.